The Shoreditch area of London has been an internationally significant street art location since the early 2000s. Its walls have been decorated by leading local street artists such as Banksy, Eine, D*Face, Sweet Toof and Pure Evil while many of the world’s leading artists such as Swoon, Roa, Blek Le Rat and Vhils among others have placed beautiful artworks on the street. The area supports a thriving community including street artists and graffiti writers, street art galleries, street artist studios, suppliers and other creative industries. The work on the wall is constantly changing and our guide is out there every day driven by a passion to explore the latest and best in this energetic, dynamic and cool scene. Tour guide Dave has been a lauded photographer and key commentator on London’s street art scene since 2006. With friend and co author of the renowned Graffoto blog Sam, Dave conceived and ran London’s very first Street Art Tours in aid of Cancer Sell charity in early 2008. He also founded London’s first Street Art Photography Workshop and has been a contributing photographer to cult scene magazine Very Nearly Almost since its early issues. He has been exhibited in several street art and graffiti photography exhibitions and is identified as one of the top 5 photographers by graffiti website Keyseventeen.com. He has written extensively on the subject, including contributing writing to abandoned building art book “Out Of Sight” (Carpet Bombing Culture) and the introduction to Steam 156’s 2013 book “Street Art London”. Not to forget more than 250 articles on the widely followed street art and graffiti blog Graffoto. Dave loves leading groups around the wonders of Shoreditch and talking about street art, truly an ambassador for the scene. Please check the calendar for available tour dates. Lines: Central, Hammersmith and City, Circle, Metropolitan, mainline trains. comfortable shoes, comfortable clothes, light anorak and umbrella in case of rain (check forecast). Being wet is no problem when properly prepared; being cold spoils your fun so dress warm! We pass plenty of newsagents and local shops where you can top up with fluids and snacks if required. Is the tour suitable for children/teenagers? Yes. Have a look at what other guests have said on tripadvisor in response to this question. Tours will take place even if it is raining, in fact rainy conditions often give great opportunities for better photographs. All tours and workshops conducted in English. Guests are not permitted to bring BMX bikes, skateboards or scooters on the tour. Street Art tours take place on public highways and from time to time may go onto private property. Clients are responsible for their own conduct and safety and participate in the tours at their own risk, participation in any tour is deemed to be acceptance of that. 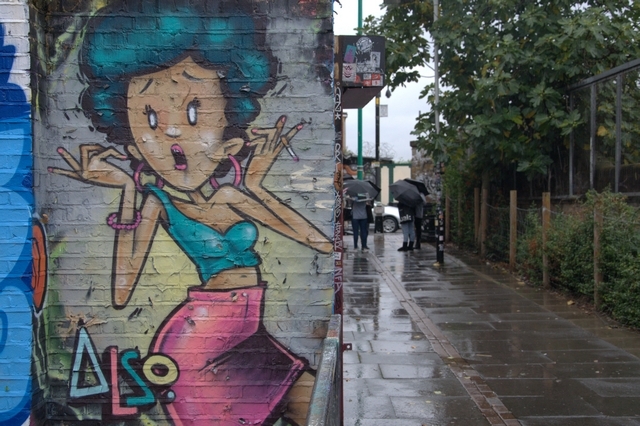 No liability can be accepted by Shoreditch Street Art Tours or its employees or affiliates. Walk route may (will!) be varied taking into account any fresh and exciting street art worth finding.